Wanderers C’s unbeaten start to the Division Two season in the Wellingborough & District Table Tennis League was ended by a 6-4 home defeat to St John B.
Alan Hill scored a fine treble for the visitors and received good support with two wins from Steve Mansfield and a single from Paul Lipczak. James Findlay was the pick of the home players with good wins against Mansfield and Lipczak. A hard-fought battle between the two Higham teams ended all-square as Higham Harriers B and Higham Band A drew 5-5. Deirdre Kiziak and Nigel Magee took the doubles in four close ends to secure the draw. Bob Collyer was the only home player to remain unbeaten with Magee and Keith Stockley scoring two wins apiece for the visitors. Phil Inman and Craig Hartwell both gained single wins as they adjust to life in the division. Westfield C edged out Wanderers D 6-4 to record their first win of the season. Mark Ramsden starred for the visitors with a great treble, losing only one end all night. He was ably supported with a brace from Tim Mason and the pair of then combined to take the doubles in straight ends to secure the win. Roger Ellingham put up most resistance for the home team with a fine double. Westfield B maintained their unbeaten record and ended WDHA Superkings’ with a 7-3 success. Charlie Clements led the way with a fine treble and was well supported with two wins apiece from Roger Arterton and Mark Thomas. Dev Patel scored two good wins for the visitors and teamed up with Manav Pandya to win a thrilling doubles encounter 12-10 in the fifth end. Results: Higham Harriers B 5 (Phil Inman, Craig Hartwell, Bob Collyer 3) Higham Band A 5 (Nigel Magee 2, Keith Stockley 2, doubles Magee/Kiziak), Wanderers D 4 (Roger Ellingham 2, Graham Babbage, Mike Howorth) Westfield C 6 (Mark Ramsden 3, Tim Mason 2, doubles Ramsden/Mason), Wanderers C 4 (Tony Wallis, James Findlay 2, doubles Wallis/Jones) St John B 6 (Steve Mansfield 2, Alan Hill 3, Paul Lipczak), Westfield B 7 (Roger Arterton 2 , Charlie Clements 3, Mark Thomas 2) WDHA Superkings 3 (Dev Patel 2, doubles Patel/Pandya). Fielding two players for the second time this season could well have cost Thrapston the match as they were beaten 6-4 at Wanderers A in Division One. Ian Donaldson went down 11-4 in the fifth to Tony Wharton and 11-7, 9-11, 11-13, 5-11 to Andy Law but avoided a blank when beating Jon Taylor-Burt. Chris Warliker was well beaten by Wharton but edged out Law 11-9 in the fifth and comfortably saw off Taylor-Burt. The visitors gained their fourth point when Donaldson and Warliker won with surprising ease 11-3, 11-5, 11-3 in the doubles over Law and Wharton. For the second game running, Chesterwell B fielded only two players and with St John A, for once, at full strength, a big win looked likely and so it proved as they hosts won 9-1. Graham Ellson, well below his best, failed to register and with Pete Boustred and Grant Timms comfortably seeing off Luke Hughes, it was only a surprise win by Hughes in game four over Richard Wills (11-5, 11-3, 11-7) that prevented a clean sweep. Elsewhere, Chesterwell A beat Wanderers B 8-2. Stewart Williams opened with an unlucky five-set defeat to Valdy Papiernik and must have thought a whitewash was on the cards. However, he followed up with an excellent brace, seeing off Stan Galkowski (13-11, 11-4, 11-8) and Mike Pond 12-10 in the fifth. Bob Hickson, who is struggling for form, failed to gain a leg but Paul Goodman nearly took a third point, going down 11-3, 6-11, 11-8, 8-11, 9-11 to Galkowski. Results: Wanderers A 6 (Tony Wharton 2, Andy Law, + 3 points by default) Thrapston 4 (Ian Donaldson, Chris Warliker 2, doubles Donaldson/Warliker), St John A 9 (Pete Boustred 2, Richard Wills, Grant Timms 2, doubles Boustred/Timms, + 3 points by default) Chesterwell B 1 (Luke Hughes), Chesterwell A 8 (Mike Pond 2, Stan Galkowski 2, Valdy Papiernik 3, doubles Galkowski/Papiernik) Wanderers B 2 (Stewart Williams 2). With all the early cancellations, Chesterwell D are the only team to have played their full quota of games in Division Three and already have a lead of 18 points over their nearest rival Stanwick. This week Higham Band B were under the hammer, going down 10-0, despite some close games. Both Raylee Burton and Devlin Whitmore went to five against Duncan Wright and Burton also finished 11-13 in the fourth against Daniel Mann. Jonathan Driscoll, Mann and Wright secured hat-tricks as well as the double in three ends. Last season’s Challenge Trophy winners, WDHA Challengers could only manage one point in their match against Westfield D.
Daniel Bain won an exciting opening set against Stuart Holroyd, winning out 11-8, 9-11, 13-11, 14-12. No other sets required a decider but Rishan Ganatra came close before losing to Holroyd. Westfields’ new signing, Asish Nandi, and Amrat Mistry gained hat-tricks and added the doubles for their ninth point. Westfield E have only played two games so far this season and have only dropped two points. In their 9-1 success over WDHA Knightriders, there were hat-tricks for Iain and Stuart Rae and a double for Nicole King, who lost out to Bipasha Ganatra 11-9, 5-11, 9-11, 11-3, 5-11 for the visitors’ only point. Swati Jethwa was unlucky not to gain a second point for the team in her close battle with King, losing out 11-9 in the 5th. Results: Chesterwell D 10 (Johnathon Driscoll 3, Duncan Wright 3, Daniel Mann 3, doubles Wright/Mann) Higham Band B 0, Westfield D 9 (Stuart Holroyd 2, Asish Nandi 3, Amrat Mistry 3, doubles Nandi/Mistry) WDHA Challengers 1 (Daniel Bain), Westfield E 9 (Iain Rae 3, Nicole King 2, Stuart Rae 3, doubles King/S Rae) WDHA Knightriders 1 (Bipasha Ganatra). WDHA Juniors participated in the National Juniors League for the first time with the first round of matches played at Weavers Sports Centre in Wellingborough. The team entered in Division Two and were promoted to Division One for the next round after an unbeaten record saw them top the table with 24 points. They beat Westfield A 5-1, Bedford Modern 4-2, Cliffedale Chandlers A 6-0, Lillington B 6-0 and drew 3-3 against St Neots. The team was made up of Abin Islam, Ethan Ali and Virat Patel. Patel finished second in the averages with 90 per cent while Ali (80 per cent) was third and Islam (70 per cent) fifth. The club’s head coach Graeme McKim said: “The boys played well, extremely well and it just shows that their hard work has paid off. 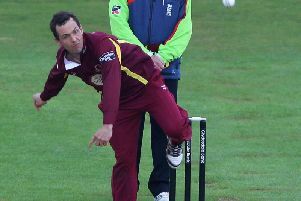 “It was great to see the team beat some of the experienced sides in this competition.